From left to right: Walter (Jacob Trillo) and Bruce (Anthony Arnista) are in big trouble after their magic act turns deadly in White Collar Crimes’ Perpetual Wednesday. 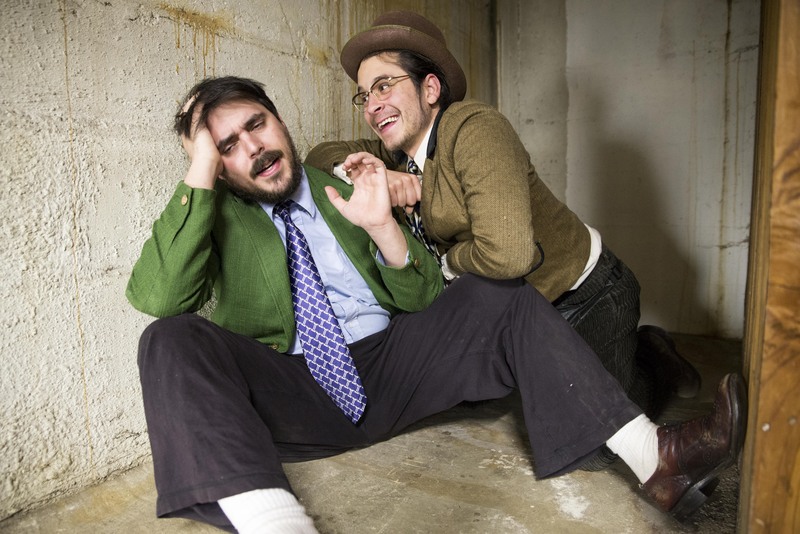 When two-bit magicians Walter (Jacob Trillo) and Bruce (Anthony Arnista) mess up, boy do they really mess. White Collar Crimes’ Perpetual Wednesday, created by Arnista and Trillo, follows Walter and Bruce after a disastrous magic act where they may or may not have shot a man in the face. Walter insists it was all part of the act, that the audience volunteer is perfectly fine. Bruce isn’t so sure, after all the blood and the body he chopped up seemed pretty real to him. Trillo and Arnista’s hyper-energetic act makes for a very sweaty performance inside the hot Lantern Church Sanctuary. Shadow theatre, dance, and off-colour humour, the actors’ amusing variety show has it all. Trillo and Arnistra’s showmanship is impeccable. The show, unfortunately, loses momentum once it dives straight into the rabbit hole. One moment Walter and Bruce are the sort of sleazy magicians you might find at a Las Vegas lounge, the next it turns out they’re actually immortals who struck a deal with the ancient Egyptian god Anubis. The joke that Walter and Bruce were actually some of history’s iconic figures, while fun at first, becomes tired. The two in time come around to settle the matter of the dead man, but by then the whole ordeal has collapsed under its own weight. The audience is left with an abrupt, less than satisfying ending. Ultimately, Trillo and Arnista’s Perpetual Wednesday entertains, despite some script issues that hold back its full comedic potential. White Collar Crimes’ Perpetual Wednesday runs July 31st – August 8th as part of the 2015 Calgary Fringe Festival.